Check out the video (4:30 min) to learn how to use data values or read the detailed guide below! What's the use of data values? 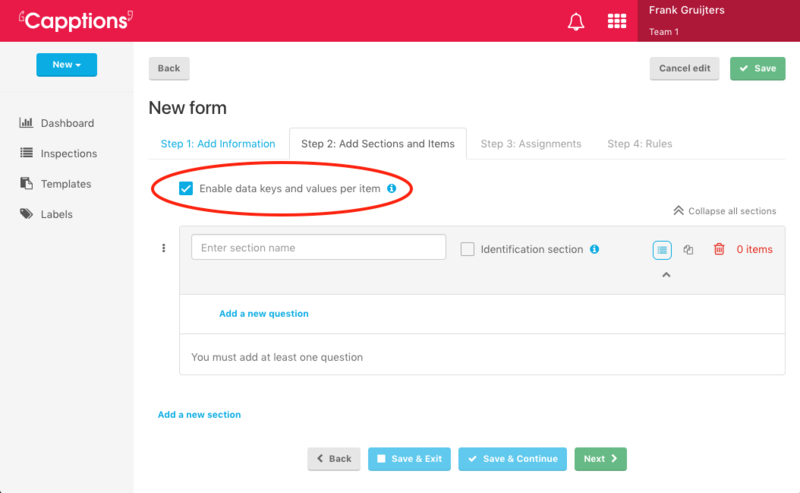 By adding values to your multiple choice answers, you can make calculations and weigh them. This can be very useful in order to analyse them, especially in case of surveys. By adding specific text or codes to your inspection items and answers, you can easily integrate one or more specific inspections with your existing systems. When using the data values you will see these values when exporting one or more inspections to Excel or pdf. After you turn on the data values for a specific inspection template by checking the checkbox, you can start editing the template. As you will see, when creating a new inspection item, after the 'help text' of the inspection item, a new tab 'data key' is available. Here you can define a 'data key' (the technical name of a question) and a data value type. If you want a score behind your answers, choose 'Number'. None (Default. For inspection items where you don't need data values). Text (For integration purposes, you want to fill in specific text for the answers to be identified by your external system you want to integrate with). Now return to the first tab ('Item'). In case you've selected 'number' for the answer type 'single select' or 'multiple select', the value boxes will appear where you can enter values (see image below). In these fields you can fill in the numbers you want to use (for example 1 for yes and 0 for no, or 100 for excellent and 0 for bad). The users who conduct the inspections won't see any data values. After the inspections are completed, you can export them and see the data values in the exports. Repeat this for all the questions where you need a score or value!
! EXPERT TIP: If you have a lot of similar questions (e.g. a lot of questions with options OK, Not OK, Not Applicable); use the copy question function after you've added the data values! It'll save you lots of time!